YOUR COMMUNITY. YOUR VOICE. YOUR VOTE. Since 2010, Fire Works American Pizzeria & Bar has grown to become a go-to ‘fan favorite’, in Arlington, with a rich selection of delicious tasty mouth-watering pizzas, a wide variety of beers, 33 on tap, and over 120 in bottles. We’re close to you, on Clarendon Boulevard and North Adams Street, near Courthouse Metro, with a massive two-deck parking garage underneath our outdoor patio and restaurant. Fire Works is very proud, humbled and thankful to readers who voted for us, winning six categories in the 2017 Best of Arlington Poll. IT DOESN’T GET ANY BETTER THAN FIRE WORKS! Arlington’s Best, decided by you! The votes are in-nearly 16,000 of them! 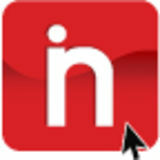 ­And readers of InsideNoVa.com and the Sun Gazette have chosen winners in the annual “Best Of Arlington” contest. Voting in the annual competition took place online in February, with winners selected in a wide array of categories. Congratulations to all the winners, and thank you to our readers for helping determine the best of the best in our local community! Rosslyn BID’s Outdoor Summer Movie Festival 1911 N. Fort Myer LL-10, Arlington VA 22209 571-535-3086 | rosslynva.org The Rosslyn Business Improvement District (RBID) is a non-profit, private organization with the mission to provide high-quality, customer-oriented services designed to define, enhance and continually improve Rosslyn for those who work, live, visit and do business here. We take an active leadership role in all that we do, serving as a collaborator, community builder and agent of positive change. Our core services include hospitality, public realm enhancement, social services coordination, marketing of Rosslyn, community events, urban design and economic development. Through our work we are achieving our vision of Rosslyn as the premier, mixeduse urban center in the area. Please visit www.rosslynva.org or @RosslynVA. Tradition Homes is once again voted Best Builder by Arlingtonians! Dr Mary Ellen Gallagher, M.D. Thank you for Voting Us Best !! BEST General Practitioner in Arlington!!! BEST Pediatrician in Arlington!! BEST Other Medical Specialist in Arlington!! BEST Alternative Medicine Provider in Arlington!! Northern Virginia Internal Medicine & Pediatrics, PC Specialist for Adults. Specialist for Kids. Care for the entire Family. Mary Ellen Gallagher, M.D. Searching for the Best Veterinary Care? Fire Works Pizza 2350 Clarendon Blvd., Arlington, VA 22201 703-527-8700 | FireworksPizza.com Since 2010, Fire Works American Pizzeria & Bar has grown to become a go-to ‘fan favorite’, in Arlington, with a rich selection of delicious tasty mouthwatering pizzas, a wide variety of beers, 33 on tap, and over 120 in bottles. We’re close to you, on Clarendon Boulevard and North Adams Street, near Courthouse Metro, with a massive two-deck parking garage underneath our outdoor patio and restaurant. 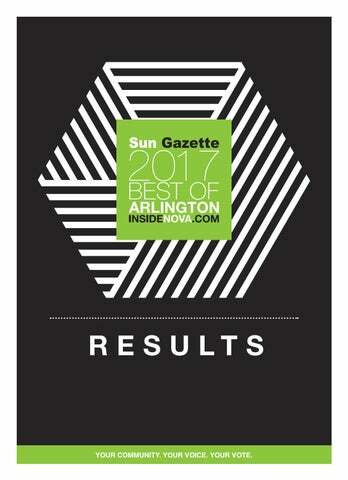 Fire Works is very proud, humbled and thankful to readers who voted for us, winning six categories in the 2017 Best of Arlington Poll: Best Pizza; Best Family Dining; Best Gossip Center; Best Bartender: Mike Ozdowski; Best Server: Brian Malone*, (*Brian won in 2016, as well); and Best Boss: Kevin Malone. Thank you, once again, and for more ‘bites’, please go to www.fireworkspizza. com/Arlington/Web. Make Up & Style Design You are BEAUTIFUL! THANK YOU! Spread the Word! Dr. Mary Ellen Gallagher, M.D., Northern Virginia Internal Medicine & Pediatrics, P.C. Planning to sell your house in 2017? In the market for a neighborhood real estate specialist, who will work tirelessly on your behalf? Give me a call today for a home market analysis and consultation. I would love the opportunity to help you with your real estate needs. The YMCA Arlington Connecting and Serving Arlington Since 1944 Thank You Arlington for Supporting the Y for Over 70 Years! The YMCA Arlington provides scholarships and financial assistance to those in need so they could participate in YMCA programs. Since 2010 the YMCA Arlington has provided over $690,463 in scholarships and financial assistance to those in need. Hosts classes on health management such as Stroke Survivors fitness and YMCA Diabetes Prevention Program. YMCA Arlington’s Youth & Government program helps youth learn about advocacy and government. The YMCA Arlington provides enrichment programming at elementary schools in the areas of nutrition, sports and recreation and STEM (science, technology, engineering and math). Implemented the USTA’s 10-and-under “Quickstart” Tennis Initiative enabling juniors to learn tennis skills in the most effective and fun way possible. Hosting senior beginner tennis instruction programs. Offers nutrition education to the community. The YMCA Arlington hosts one the of the largest free community health days with its annual Healthy Kids Day. Healthy kid’s day encourages healthy habits for children and families. Provides sports programs for children and teens of all ages and interests, including tennis, gymnastics, basketball and various other sports. In partnership with the CitiOpen, enables Y kids and military families to participate in tennis clinics led by ATP tour players. Hosts after-school enrichment programs, free of charge, to address community needs for students at Arlington Title I schools. Hosts day-long volunteer projects and provides on-site job training and activities. Teaches youth about STEM, recycling, aeronautics at the Y’s Annual Thingamajig Invention Convention where local children experience hands-on learning and teamwork. Serves as the host site for USTA young professional events for the Mid-Atlantic region. 1497 Chain Bridge Rd., Suite 100 McLean, 22101 703-987-3444 | builtbytradition.com As Tradition Homes enters its 11th year designing and building custom homes in the Northern Virginia suburbs, brothers George and Steve DeFalco continue to offer the knowledge and services of a larger firm while maintaining the personalized feel of working with individual specialists—all in one location. “We try to make both our staff and our clients feel like they’re part of a family,” say the DeFalcos. “We operate on a truly personal level, getting to know our clients’ families as we design the special places—bookcases, window seats, study nooks, storage cubbies—inside their new home”. Thank you Arlington for choosing Studio K Interior Design & Window Treatments as Best Interior Designer, 2017! Michael & Son services was founded in 1976 by Michael Moussa Mansour. In 1990, Michael suddenly passed leaving his son, Basim Mansour to take over the family business at the age of 19. Through the values instilled by his father and a passion for quality service, Michael & Son is known throughout the region as your one stop for all of your home’s plumbing, electrical, heating & cooling, remodeling and restoration needs. Michael & Son offers you a lifetime guarantee on most plumbing and electrical repairs for as long as you live in the home. visit us at michaelandson.com. Laura, Adagio Ballet 4720 Lee Highway, Suite E, Arlington, VA 22207 703-527-8900 | adagioballet.com Adagio Ballet School of Dance offers dance classes and camps for ages 2 through adult in Ballet, Jazz, Tap, Modern, Lyrical, Hip Hop and Musical Theater. Join a class with our experienced faculty who are career professionals in dance and childhood education and give your child the gift of dance, friendship and memories for a lifetime. Our age-based curriculum nurtures creativity and self-expression, while in inspiring a love for learning and exercise through movement and music. Our annual performances, in-house black box theater events, and regular parent observations offer opportunities to celebrate our students and come together as a community!